As we head into kids’ spring sports seasons, crock-pot meals make a more frequent appearance in our house. I especially like this one in the spring and summer, because it is not a heavy meal like many crock pot meals tend to be. 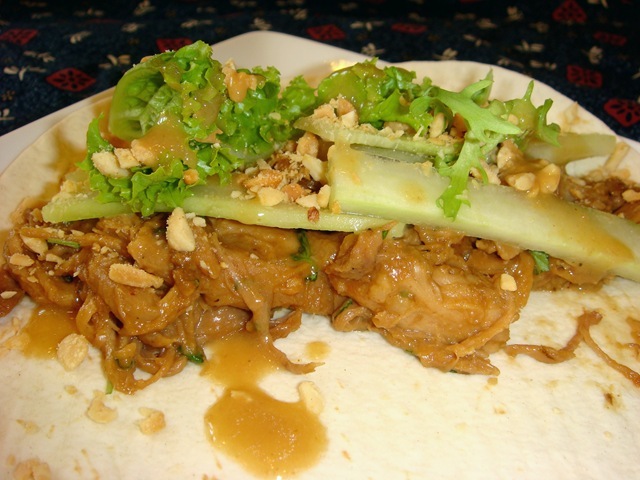 Cooked and shredded pork in a slightly spicy peanut sauce, topped with crisp, cool cucumber slices and lettuce. Sprinkle with some chopped peanuts and an Asian dressing, and roll the whole thing up in a tortilla (or use whole lettuce leaves for a twist on the traditional lettuce wrap). You can use either pork tenderloins or a cheaper pork loin. After cooking in the crock pot all day, both will turn out super tender. Simply put the pork in your crock pot. Combine sauce ingredients (except peanut butter) and pour over pork. Cook on low for 6-8 hours, or until pork is tender enough to shred. 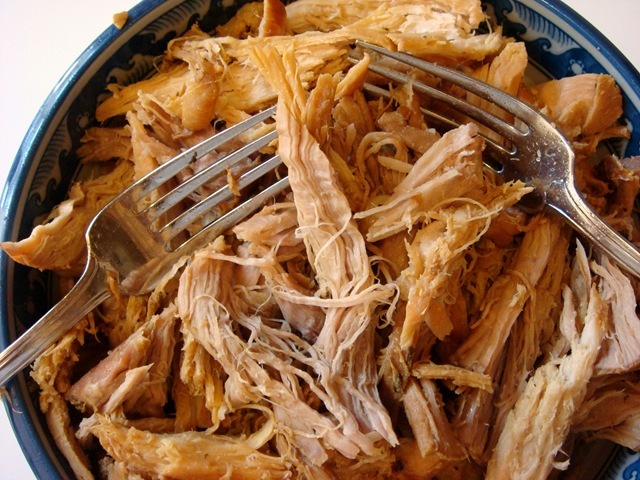 Remove the pork roast from the crock pot and shred with forks. Stir some peanut butter (either creamy or chunky) into the sauce in the crock pot. Return pork to crock pot and mix into sauce. 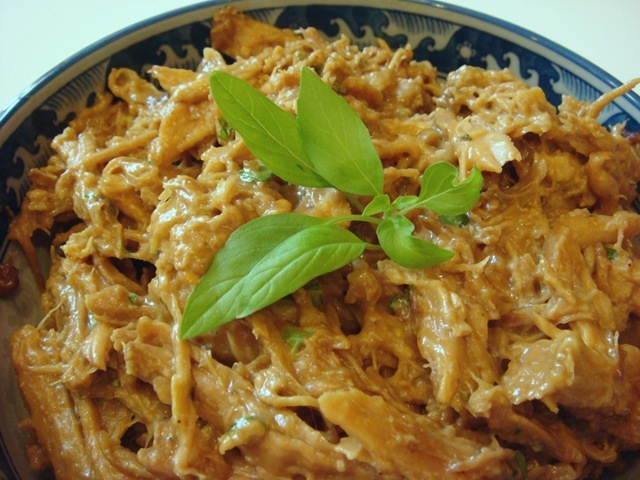 Stir in some Thai basil (cilantro also adds a nice flavor, if you don’t have Thai basil). 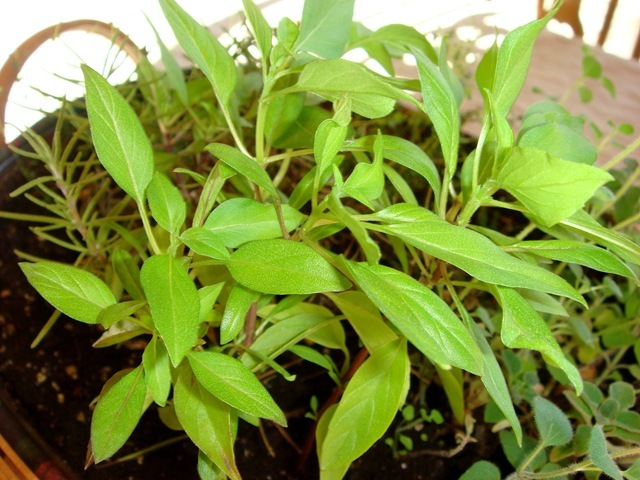 I grew Thai basil in our garden last year and loved it! I brought some inside in the fall and have been trying to nurture it along during the winter. I am excited to plant outside again soon! I serve this in warmed tortillas with lettuce, chopped peanuts, sliced cucumbers and an Asian dressing (which is completely optional; the wraps are flavorful enough that you don’t need additional dressing, but the slightly sour vinegar taste does add a nice flavor). 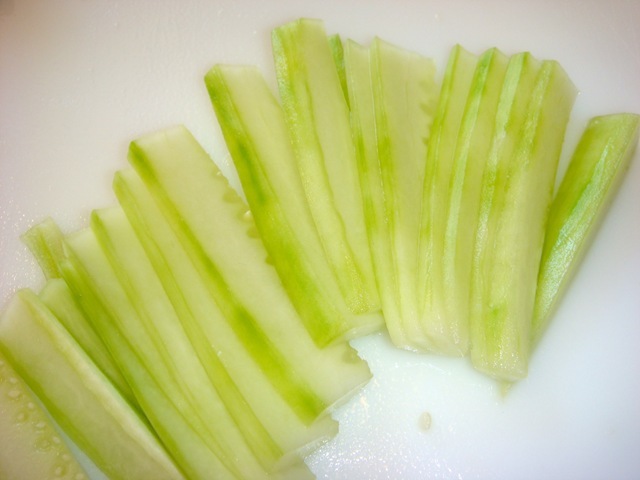 For the cucumber, I use a seedless cucumber and slice it into wide julienned strips. Peel and slice cucumber in half crosswise (giving you 2 cylinders). Cut in half again lengthwise. Slice each piece lengthwise into very thin strips (they should resemble long rectangles, not half-circles). This in our favorite Asian dressing. It is found in the supermarket in the produce section by the sushi. 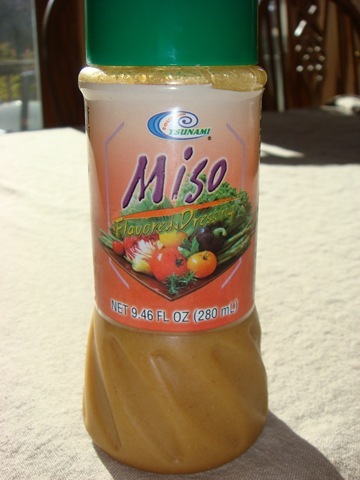 You could also use any Asian ginger or sesame/tahini based dressing, as well. The flavorful, tender pork topped by the crunchy peanuts and cool, crisp cucumbers and lettuce make for a great texture combination. And the convenience of preparing it early in the day is definitely a plus on hectic weeknights. 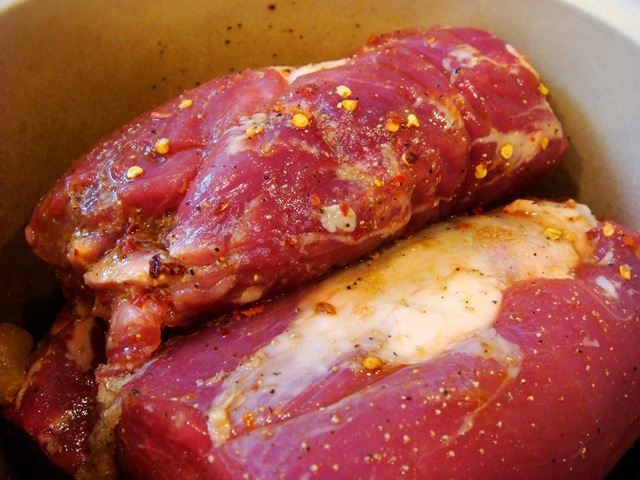 Place pork roast in crock pot. Combine soy sauce, lemon juice, brown sugar, garlic, ginger, red pepper flakes, salt and pepper. Pour over roast. Cook on low for about 6-8 hours (about half that on high). Remove pork and skim excess fat. Stir in peanut butter. Shred pork and return to crock pot. Turn crock pot to high and cook for 5-10 minutes uncovered (longer if pork is too liquidy). Stir in Thai basil or cilantro just before serving. Chop lettuce. Finely chop peanuts. Julienne cucumbers: Peel and slice cucumber in half crosswise (giving you 2 cylinders). Cut in half again lengthwise. Slice each piece lengthwise into very thin strips (they should resemble long rectangles, not half-circles). 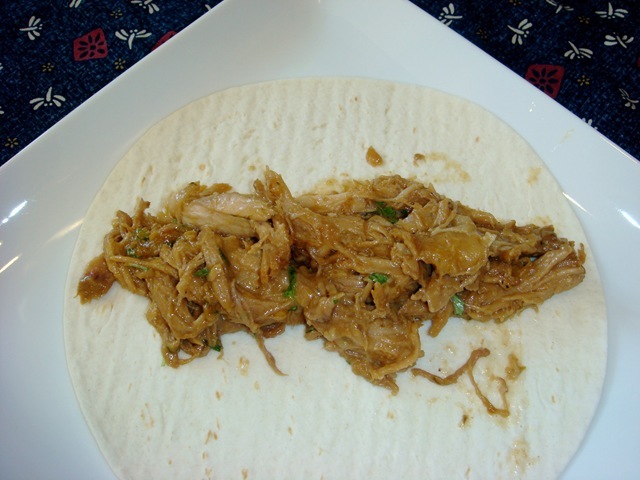 To serve: Place pork in tortillas. Top with lettuce, cucumbers, peanuts and dressing. **These are also good eaten as lettuce wraps; just use iceberg or Bibb lettuce instead of tortillas. These look so delicious! With summer here and bike riding season upon us yet again – crock pot meals will be making a big appearance in our house as well! I’ll have to see if I can find some of that miso seasoning! I have never seen anything like it before! I think I stumbled upon your blog via pinterest…and I just made these tonight. They were FANTASTIC! I forgot to get the dressing at the store, so we served it with this dressing. It was FABULOUS! I’m glad you enjoyed them. That dressing sounds really good as well!